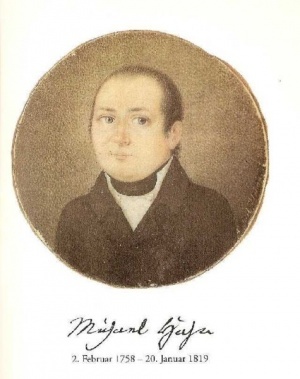 Johann Michael Hahn, born 2 February 1758, at Altdorf near Böblingen (Württemberg), died 20 Januaary 1819, a simple peasant who had also learned the trades of butchering and clockmaking, the founder of the brotherhood of the "Hahnischen" or "Michelianer," and the author of a number of books explaining his speculative theosophical system of doctrine. In 1777, while working in a field, he had a vision of three hours' duration. Inwardly converted, he withdrew from all associations and attended the meeting, where he soon acquired great influence. In 1780 he had a second vision, which lasted seven weeks. He received a "central insight," and "looked into the innermost birth and heart of all things." From now on he proclaimed his doctrine as a fluent, inspiring speaker and a profound author. After 1794 Hahn found an asylum in Sindlingen near Herrenberg on the estate of Franziska, Duchess of Hohenheim, where he devoted the rest of his life to his spiritual work. The Holy Scriptures, which were his unquestioned authority, he interpreted somewhat allegorically. The world, ruined by sin, will be transformed by the redemptive work of Christ into a spiritual body. He urged complete sanctification and separation from the world. His eschatology was especially highly developed, as well as his teachings on the first resurrection, on the places of purification and the interim state in the Beyond, on the expectation of the Antichrist, of the millennium, and the restoration of all things. He was also the author of sacred hymns. Three of his (approximately 2,000) hymns were taken into the hymnal of the South German Mennonites. The membership of the brotherhood founded by him was estimated in 1920 at about 15,000. His views were favorably received in two Mennonite congregations in Baden, Dühren and Heimbronnerhof, which separated from the Verband in 1858. His numerous writings were posthumously published in 13 volumes (Tübingen, 1819-41). Die Hahn'sche Gemeinschaft, 2 ed. Stuttgart, 1949. ("Hahns Leben," 5-30, "Hahns Lehre," 31-139). Hege, Christian and Christian Neff. Mennonitisches Lexikon, 4 vols. Frankfurt & Weierhof: Hege; Karlsruhe: Schneider, 1913-1967: v. II: 232 f.; III: 124-126. Neff, Christian. "Hahn, Johann Michael (1758-1819)." Global Anabaptist Mennonite Encyclopedia Online. 1956. Web. 20 Apr 2019. http://gameo.org/index.php?title=Hahn,_Johann_Michael_(1758-1819)&oldid=146462. Neff, Christian. (1956). Hahn, Johann Michael (1758-1819). Global Anabaptist Mennonite Encyclopedia Online. Retrieved 20 April 2019, from http://gameo.org/index.php?title=Hahn,_Johann_Michael_(1758-1819)&oldid=146462. Adapted by permission of Herald Press, Harrisonburg, Virginia, from Mennonite Encyclopedia, Vol. 2, p. 629. All rights reserved.